At noon on a clear summer day in the United States, a flat (horizontal) surface receives about 1000 watts of sunlight per square meter. (This is about 100 watts, or the power of a bright incandescent light bulb, per square foot.) Traditional dark roofs strongly absorb this sunlight, heating both the building and the surrounding air. This increases energy use in air conditioned buildings, and makes non-air conditioned buildings less comfortable. Hot dark roofs also aggravate urban heat islands by warming the air flowing over the roof, and contribute to global warming by radiating heat into the atmosphere. On a sunny day, a roof that strongly reflects sunlight can stay much cooler than a roof that strongly absorbs sunlight. High thermal emittance is another property that also keeps a surface cool. Thermal emittance is the efficiency with which a surface cools itself by emitting thermal (or "far") infrared radiation. 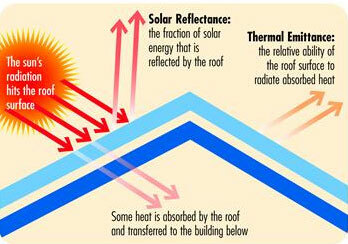 Thus a "cool" roof should have both high solar reflectance (SR) and high thermal emittance (TE). We note that since the spectrum of thermal radiation (4-80 microns) does not overlap with that of solar radiation (0.3-2.5 microns), thermal emittance is independent of solar reflectance. Thus, we distinguish between the two when defining a cool roof. Substituting a cool roof for a warm roof reduces conduction of heat into the building, convection of heat into the outside air, and thermal radiation of heat into the atmosphere. This benefits our buildings, our cities, and our planet. Cooler outside air. Cool roofs lower urban air temperatures by reducing the amount of heat transferred from roofs to the air, mitigating the urban heat island effect. Fewer power plant emissions. Reflective roofs reduce cooling energy demand in air conditioned buildings, decreasing emissions of greenhouse gases and other air pollutants at power plants that burn fossil fuels. Better air quality. Cool roofs decrease urban air temperatures and thus slow the formation of ground level ozone. Ozone, the primary component of smog, can aggravate respiratory illness and can act as a greenhouse gas. Slowed climate change. Cool roofs decrease heat absorbed at the Earth's surface and thus can lower surface temperatures. This decrease in surface temperatures reduces the flow of heat into the atmosphere, offsetting warming caused by greenhouse gases. Energy and cost savings. During hot summer months, cool roofs reduce the need for cooling in air conditioned buildings, which saves energy and money. Reduced electrical grid strain. The diminished demand for cooling energy will also moderate peak energy demand during heat waves and very hot summer afternoons, thereby decreasing the risk of power outages. Improved indoor comfort. Cool roofs lower the indoor air temperature in buildings that do not have air conditioning, promoting productivity and occupant health. Cool roofs may also have some undesirable effects. Glare. Glare from a bright white or silvery roof on a low-rise building may disturb occupants of taller neighboring buildings. In this situation a cool-colored (nonwhite) roof may be more appropriate for the shorter building. Sunshine includes ultraviolet, visible, and near-infrared light. Only visible light affects color. 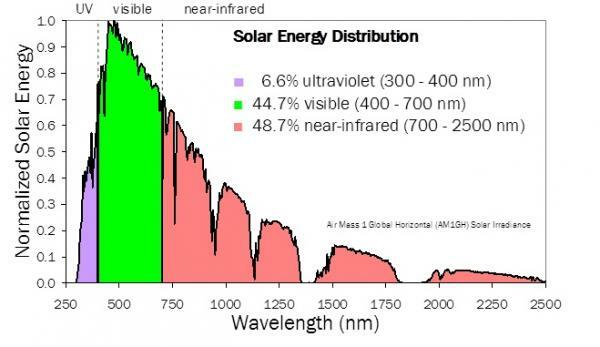 About half of the sun's energy is invisible near-infrared light. Traditional dark roofs strongly absorb ultraviolet, visible, and near-infrared light. Cool-colored dark roofs look like traditional dark roofs but better reflect near-infrared light. On a typical summer afternoon, a cool-colored roof that reflects 35% of sunlight will stay about 12°C (22°F) cooler than a traditional roof that looks the same but reflects only 10% of sunlight. White materials are a popular cool option for building surfaces that cannot be seen from the street, such as low-sloped "flat" (that is, nearly horizontal) roofs. In some parts of the world pitched roofs may also be white. 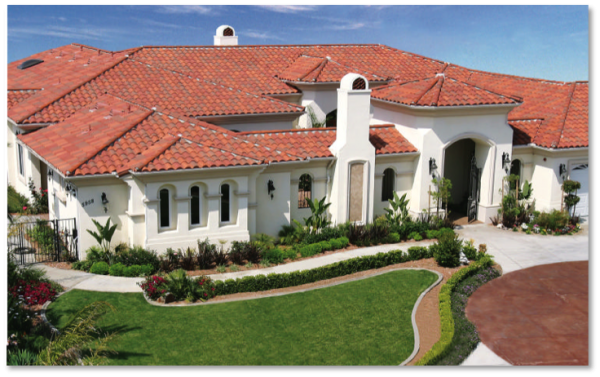 Roofing products available in white include single-ply membrane, elastomeric coating, painted metal, tile, and ballast. 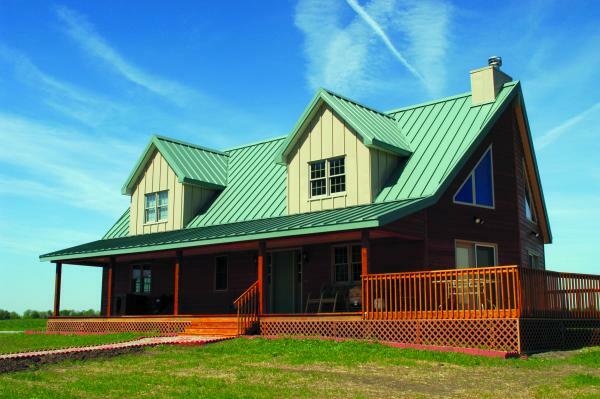 Cool-colored roofs are designed to increase reflection of sunshine while maintaining the color and aesthetic of traditional nonwhite roofing products. Over the past decade, researchers at Lawrence Berkeley National Laboratory and Oak Ridge National Laboratory have worked with roofing manufacturers to create a variety of cool-colored products for pitched roofs. 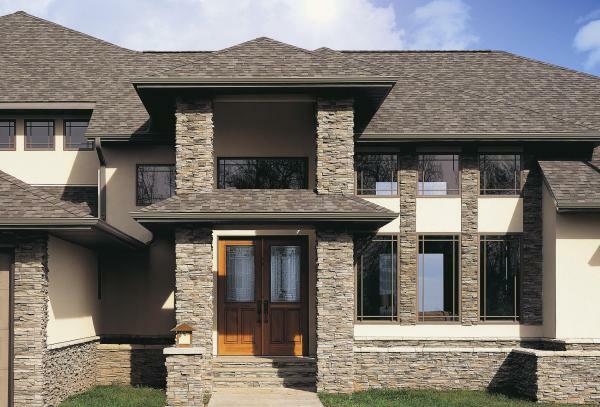 These include asphalt shingle, metal, tile, and ballast products. Cool color technology can also be used to create nonwhite materials for low-sloped roofs, such as membranes and coatings. 2 Levinson R, Akbari H. 2010. 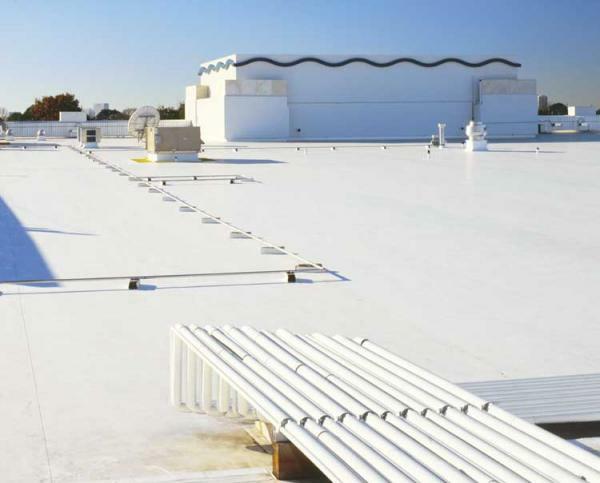 Potential benefits of cool roofs on commercial buildings: conserving energy, saving money, and reducing emission of greenhouse gases and air pollutants. Energy Efficiency. 3:53-109. 3 Calculated under the standard summer afternoon weather specified in ASTM Standard E1980-11, using the medium wind speed condition. Rosenfeld, Arthur H, Hashem Akbari, Sarah E Bretz, Beth L Fishman, Dan M Kurn, David J Sailor, and Haider Taha. "Mitigation of urban heat islands: materials, utility programs, updates." Energy and Buildings 22.3 (1995) 255-265.